Native Journeys will be a yearly event held the last weekend of April every year. Each year we will explore an aspect of Native Culture. Our premier event will be all about Music & Dance. We have Red Oak Singers as our pow wow drum. Ha'aheo O Hawai'i Hula to teach and share traditional Hula. Flute players, Storytellers, wonderful crafts, hands on activities for kids & adults, chances to dance, do some drumming, learn about the Hatteras tribes, get your name in Cherokee, and to visit and speak with Native Elders. Come and share with us! At the annual Artrageous Art Extravaganza, everyone can enjoy a little hands-on creativity with lots of interactive displays, live demos, and fun artistic activities for the young and the young at heart. This full day affair which combines art, music, and the friendly spirit of the Outer Banks, is an annual tradition that began in 1989, and which has become a favorite event for visitors of all ages. The 8th annual Mustang Spring Jam is landing on the Outer Banks in mid-May, 2019, with a collection of fantastic bands that will have all attendees dancing. This year’s line-up is a fun mix of funk, rock & roll, and blues, and features a number performing bands to provide one of the biggest and most entertaining shows yet, while supporting a fantastic local cause. Now celebrating its third year, this family-friendly event is a collection of music, sports, and OBX fun, and features a full roster of activities and entertainment to keep everyone in the party smiling. Special events within the Dare2Care OBX Shred Fest line-up include multiple bands and musicians throughout the day, live demos performed by professional skateboarders and BMX riders, a special appearance by roller derby women, appearances by Special Olympics athletes, and much, much more. In addition, the festivities will have a host of games for patrons of all ages, food, and local art vendors for unique and one-of-a-kind OBX treasures. 2019's events will also include some brand new activities, such as a cool Community Pop Up Shop, a special “Ladies Only SK8” session, and an invite-only Grom Grind showcasing some of the region's most talented 12 and under "Shredders." Enjoy one of the most scenic corners of the Outer Banks while joining in the fun of one of the longest running festivals in Manteo by attending the 44th annual Dare Day Festival. This full-day event is held along the downtown waterfront, and features a wide array of activities and attractions that shine a spotlight on the local Manteo culture. Live music will kick off at around 11:00 a.m., with the original Rhondels – a famed soul and beach music band - on the Downtown stage. Throughout the day, there will also be a number of events designed for water and OBX lovers of all ages, including the now famous Hogway Speedway Racing Pigs, the locally beloved “Anything that Floats but a Boat” Race, the Raingutter Regatta, a Kids Zone, and the annual competition for the best cake and pie in Dare County with a coveted blue ribbon prize. Hungry visitors will want to make sure they attend the Outer Banks Annual Food Truck Showdown – a new-in-2018 event on the OBX that is already garnering plenty of attention and anticipation. Featuring a wide array of food trucks, area eateries, breweries, entertainment, and so much more, this filling festival is sure to be a crowd-pleaser with any visitors who have an appetite for fresh, local, and ultimately delicious Outer Banks fare. Get your toes tapping with an island celebration of musicians, storytellers, artisans, local food, and so much more by joining in the community-wide fun of the Ocrafolk Festival. This full weekend event is held in the heart of Ocracoke Village, with multiple performances and activities happening around virtually every corner of Silver Lake Harbor. Enjoy the fireworks display with a rousing roster of patriotic music with a special performance by the 208th Army Band. The concert is free to the public, and visitors will enjoy fantastic music in addition to amazing fireworks over the water when the skies get dark. 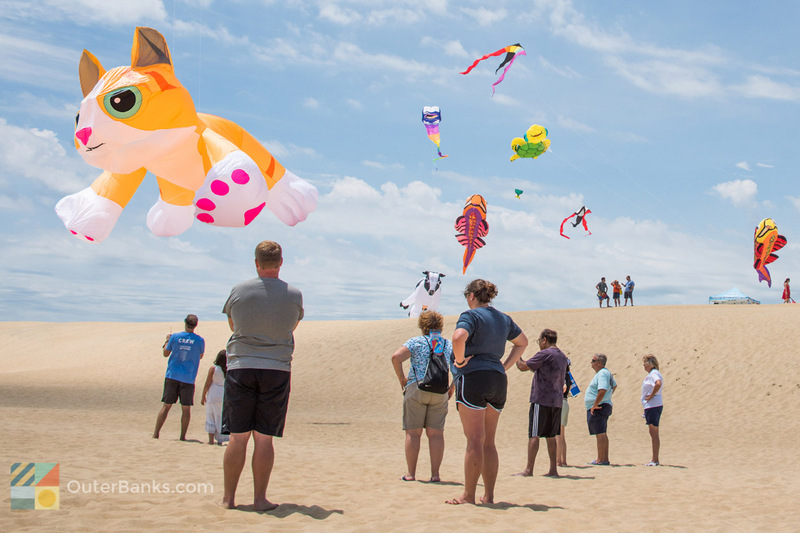 Head to the cool and relaxed Outer Banks in late September to join in the fun of one of the region’s most distinctive and popular area festivals. Pridefest is a three-day gay pride festival that is full of activities, food, music, and ample beach time, and which is open to all LGBTQ folks and their supporters and friends. Jeep fans can head to the Outer Banks for one of the biggest regional events of the year for Jeep lovers – the Outer Banks Jeep Jam. Taking place over the course of a cool September weekend, this grand event features live music, kids activities, raffles and giveaways, food and drink, and an endless number of ways to meet and greet with fellow Jeep lovers. Through arts, music, and miles of fun, the Outer Banks celebrates visiting and local veterans alike through this special event that has a wealth of ways to stay entertained while discovering the heart of the islands’ cultural scene. OBX Veterans Week is an annual event which honors veterans and their families through live concerts, cool activities and arts in downtown Manteo, and so much more. Celebrate the vibrant Latino community on Ocracoke Island which has been growing and thriving in the past 20 years with this special festival that features a wealth of tempting foods, arts and crafts, music, activities for kids, and much more. Held at the Ocracoke School during the day and the Ocracoke Community Center at night, this festival deliciously combines education and effortless fun to present a day that visitors of all tastes will adore. Head to the heart of quiet downtown Manteo for this annual tradition that illuminates the beginning of the holiday season in the central Outer Banks. The Manteo Christmas Tree Lighting is a favorite holiday event for residents and visitors of all ages, and is a great way to enjoy a dose of holiday spirit in one of the most charming communities along the North Carolina coastline. Ring in the New Year in the spot where the New World began at this fun and family-friendly celebration that takes place in the heart of Downtown Manteo. The New Year in The New World is a perfect destination for a family-oriented New Year’s Eve that visitors won’t soon forget, and it features a wealth of activities, attractions, and other fun to start 2020 off with a bang. Start your morning with a hot, made-from-scratch breakfast at Stack’em High Pancakes. This cozy pancake house offers a variety of omelets and pancakes, as well as all your breakfast favorites. If you’re ready to eat, you’ll love Stack’em High Pancakes’ fast service. You place your order at the counter as you walk in, and then get seated by wait staff, who will bring your food out to you.